How does Andrew deal with meeting fans in person? Print isn’t dead…right? Brian debriefs from his Dance Showdown shoot. Blood Moon mythology! Using nanotechnology to treat diseases. We’ve got a scoop on NASA’s big announcement on Monday. Andrew and Justin are joined by Bryce Castillo to discuss mobile ad blockers and the state of monetization for online platforms. What is and isn’t sustainable? 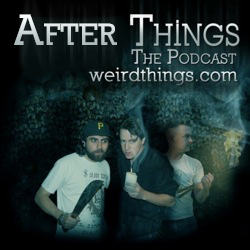 Andrew and Justin are joined by Weird Things producer Bryce Castillo. A historic discovery deep underground in South Africa. Slowed developments in NASA’s deep space Orion capsule. Tom Merritt joins Andrew and Brian as they talk about the term “a creative” and how important it is to be multi-faceted. Andrew and Brian are joined by Tom Merritt this week as we nuke space. Giant viruses are BACK! Choppy weather on the sun. Justin’s Kickstarter is hours away from ending. Tips and tricks for crowdfunding to make up for your own deficiencies. John Teasdale also joins the conversation. You are currently browsing the Weird Things blog archives for September, 2015.